After starting the 2014 season 7-3 and stifling teams with their defense, the Kansas City Chiefs lost four of their final six games and missed the playoffs by one game. The main reason for the decline came from the passing game, where no Kansas City WR caught a single TD pass. To improve the passing game, KC signed Jeremy Maclin and drafted Chris Conley. Unfortunately, Kansas City has a very tough schedule which will make it difficult to hit .500 this year. We don't see the Chiefs making the playoffs in 2015. 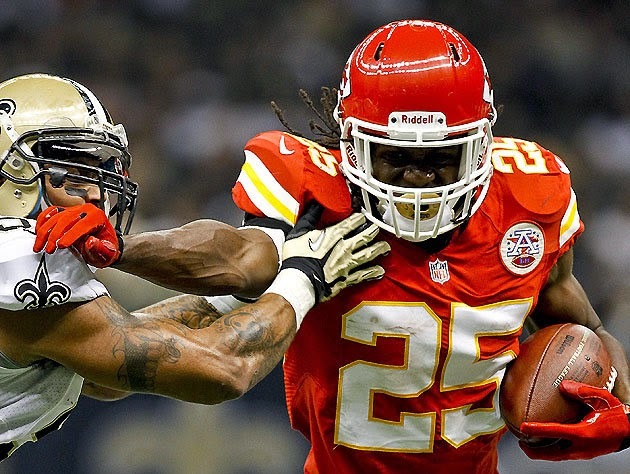 Kansas City is expected to put together a better offensive season in 2015 than 2014. The Chiefs don't have to play Seattle, St. Louis or Arizona, which will help. We project the entire offense getting slightly better, but we don't see fantasy star potential out of anyone but Jamaal Charles. Kansas City's defense was a bright spot for most of the 2014 season, ranking 2nd in points allowed and 7th in yards allowed. Kansas City has plenty of high end talent, and have proven strong for two straight years, so we'd recommend their starters in IDP formats, and their DST in redrafts formats for 2015.